Marja Verschoor-Meijers was born and raised in The Netherlands. She is a freelance writer, speaker and award winning author of several books on Christian living. Her books have been translated in Dutch, German, Italian, Spanish, Polish and Russian. She writes weekly on her weblog ‘Fresh Insights on Ancient Truths’. Together with her husband Jan she is the co-founder of the non-profit organization Traveling Light. They offer practical help, financial support and spiritual encouragement to ministries all over Europe and the Middle East. In Spirit of Truth, Marja Verschoor-Meijers asks a very important question: "What is Truth?" This is something we have all asked ourselves at one time or another, most likely in a sentence like "is it true" or "who is telling the truth." Often adverts will draw a similar response in "I wonder if that really works," which is a way of asking are they telling the truth. Another example would be in a courtroom. When a person is in court, everyone will make a judgement on whether the defendant is telling the truth, but ultimately it is the judge who will hand down a conviction. How do we distinguish truth from lies, exaggerations, half-truths, and little white lies? Is it worth telling the truth in all instances? So we often make up our own truths based on feelings and intuitions. How do we find a solid rock on which to base truth? Spirit of Truth has been written to help you see this more clearly. 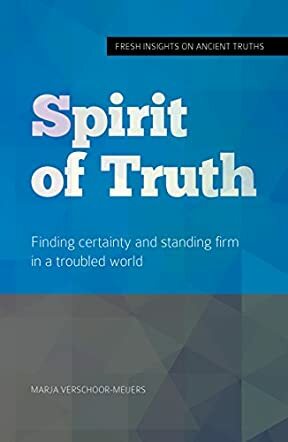 In Spirit of Truth by Marja Verschoor-Meijers, we certainly get to the heart of the matter of truth. It leads you to question your decisions, impressions and words, to decide if what you are hearing or saying is true. The introduction really draws you into a deep thought process when the trial of Jesus before Pilate is compared to a courtroom in today's times. This really gives one pause for thought, as we have all, at one time or another, watched a court case or at least followed it in newspapers or on other social media. A new perspective of the trial of Jesus is placed in your mind, which I found incredibly hard to shake, but very easy to relate to. This delightful book, well thought out and relevant to us today, will certainly give you some answers, some wonderful insight, and guide you into God's Truth. In Spirit of Truth, you will find your truth in God's law and the scriptures. A wonderful book and a unique insight which has changed my perspective! A book you will certainly read often.